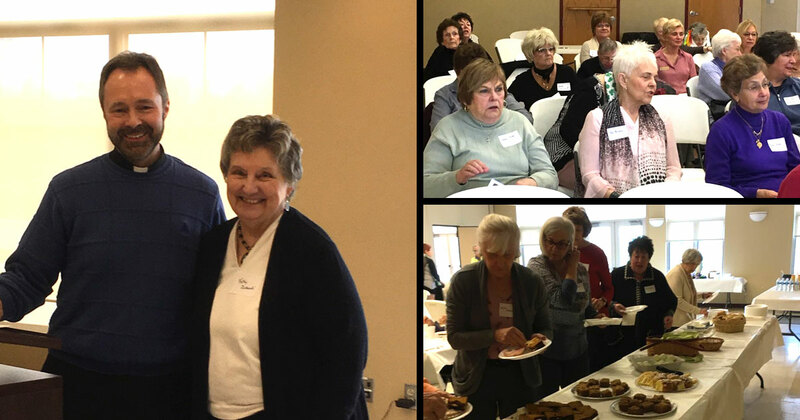 The Ladies of Charity of St. Louise de Marillac Parish, Pittsburgh PA, held a Lenten Day of Recollection with a talk on the “Seven Words” Spoken by Jesus Christ on the Cross. The speaker was Father Daniel Maurer, Senior Parochial Vicar St. Louise de Marillac and St. Joan of Arc Parish. Fr. Dan’s previous parish was St. Thomas A Becket Parish in Jefferson Hills, and when the word got out he was to speak, almost 20 Ladies of Charity from that church attended. The morning began with Mass, then the ladies gathered in Le Gras Hall for a continental breakfast. Following Fr. Dan’s talk everyone gathered for a wonderful lunch and fellowship. O divine Jesus, incarnate Son of God, for our salvation you consented to be born in a stable to spend your whole life amid poverty, trials and misery, and to die surrounded by sufferings on the Cross. Tell your Mother, Behold your child. Tell your soul, This day you shall be with me in paradise. My life passes away like a shadow; in a short while everything will be accomplished. Therefore, my adored Savior, from this moment and for all eternity, into your hands I commend my spirit.